Some evidence of the underlying host coin design will likely show somewhere. Housed in a non-PVC "flip" holder with hand-signed certificate. High-grade MS-67 quality. Each one is quad-over-struck with satiny-matte luster, sharp high-relief details, and squared rims (like a matte proof). Ordering limit of one per household. 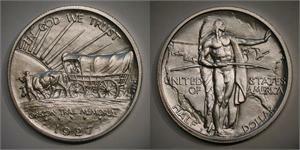 The US Mint produced Oregon Trail commemorative silver half dollars from 1926 through 1939. But several years were skipped during that span, including 1927. This Oregon Trail silver half is my favorite in a long series of incredible fantasy issues by Daniel Carr. I received a coin free from fault, letting the beauty of the design shine. An American classic...magnificent again.